Like our trip to Texas, our trip to Memphis was a success. It’s always good to see our grandsons. This time was no exception. The highlight, of course, was our getting to see Randy play with his high school band. Friday night we saw the band perform at halftime during their homecoming game. Saturday night we saw the last three bands in the regional band competition. We enjoyed each of them but too special pleasure in seeing Randy’s band. They competed against only one other AAAA school and won in every category. It was also nice to hear our other grandson, Ron, talk about his theater class. He is excited about upcoming tryouts for The Three Musketeers that they will perform in January. We ate dinner after the band events on both nights. That meant that we were up later than normal. Kate handled it well. She is a real trouper. I had previously committed ourselves to stop in Nashville on the way home to visit Kate’s best friend, Ellen, who is in a memory care unit, and our friends from the University of Wisconsin and the University of Tennessee, Ann and Jeff Davis. In order to do that, we needed to leave by 10:00 if we wanted to get back home at a decent hour. Kate was sleeping soundly, but I woke her up just before 9:00 to give her time to get a shower and dressed for the trip. She got up very willingly and was ready in time to leave at 10:00. Both visits were good ones. Ellen is declining. Her speech has been affected by her stroke a little over two years ago as well as several seizures she has had since the end of February. I think her vascular dementia is beginning to affect her now. Kate didn’t seem to pick up on this. Seeing the other people in the memory unit caused me to wonder whether it is a good thing to keep taking Kate. She doesn’t seem to notice. At least she doesn’t say anything that makes me think he feels uncomfortable. I think she just doesn’t think about her ending up in the same condition. I am glad. I wish I didn’t. We had dinner with Ann and Jeff at their home. We have lived in different cities for the past 25 years or so; however, each time we are together we pick just as though we had seen them yesterday. At one time, Ann was Kate’s best friend. That was before she and Jeff moved to Ohio. They moved to Nashville about twenty years ago. It was a great way to end what had been a very nice weekend. I recall that being paranoid is a common characteristic of someone with dementia, but up until now, I don’t recall any sign of that from Kate. I wonder if this is a sign of things to come. Yesterday Kate and I drove to Memphis to see our grandson, Randy, who is in his high school’s band. They were playing at halftime of their homecoming football game. Last spring, we came here to see our other grandson, Ron, in a junior high production of the musical Shrek. Since then Randy has been eager for us to attend one of his band performances. The trip yesterday was a smooth one. I did notice for the first time that Kate became restless on the drive. We broke up the trip with a couple of stops. Otherwise, it was an easy trip. We went to the stadium around 6:00 so that we could watch the band march into the stadium which is the equivalent of the team’s entrance to the field for parents of the football team. It was fun to see Randy march in with his band uniform. He has not hit his growth spurt and is at least a foot shorter than the boy in front of him. He had a big smile on his face when he saw us. The highlight, of course, was the halftime show itself. This year the band has worked on a program featuring the music of Gershwin. We enjoyed the show. As frequently happens, we were impressed with the quality of the performance of these high school students. Not having a child on the football team, we left after halftime. We went to a neighborhood Italian restaurant for a later dinner. It was after 10:30 when we got back to Jesse’s and after 11:00 before getting into bed. Because this is a good bit later than we usual go to bed, we both slept later. I was up at 7:30. Kate didn’t get up until about 9:00. She came downstairs and said hello. She came in with her morning pills in her hand. She very naturally picked up a beverage cup that Jesse had gotten out for herself and used it to take her medications. In a few minutes, she walked out of the kitchen. When I checked to see where she had gone, I found her under the covers in Jesse’s bed. She was there until close to 11:00 when she woke up and said she wanted to take a shower. While she was in the shower, I put her clothes out on the bed. Later I went back to check. She had gotten out of the shower. I thought she might not see her clothes on the bed and brought them to her. As I helped her by pointing out what she could wear, she responding willingly and even gratefully. This is another pattern that has emerged when we are traveling. My interpretation is that she finds everything a bit confusing and, thus, willingly accepts my help more easily than when we are at home. Over the past few weeks I have noticed that Kate has been asking me to remind her of the names of people more often than in the past. It is not surprising that this was most evident during our recent trip to North Carolina. I am, however, noticing that she is asking for names with quite a number of people and places. I suspect that the more she does it, the more comfortable she becomes in asking me to fill-in for her memory. I have always tried to affirm my desired to be here for her. My most typical response has always been, “You can ask me as many times as you want. That is why I am here.” I have othe variations of this sentiment. “I will always be here for you” is one that I have also used. Most recently, I have said, “We are a team. We will do this together.” I don’t think she literally understands fully what I am saying. I know that she takes it as a statement of support for her. For me, that is the most important thing. I want her to know that she can count on me. Our first day back in Nashville was a pleasant one. Kate’s good mood has continued. The sitter came in the afternoon. I didn’t mention to Kate that she was coming. She arrived while Kate was in the backyard, and I was getting ready to leave for the Y. Once again, Kate received her warmly, and I was off. Before leaving, I told the sitter that she had a 5:00 appointment for a massage. I asked her to make sure that Kate came to get ready around 4:00. When I returned, they were both sitting in the family room where Kate was looking at one of her family albums. As we finished our dinner last night, I asked her if she would like dessert. She often gets a scoop of homemade gelato that we share. She told me that she had had enough and would skip the dessert. Then she asked me. I told her that I had eaten so much on our trip that it would be good for me to pass it up. Just then, our server approached the table and asked if we wanted dessert. Kate immediately asked, “What do you have?” Of course, she ended up with her gelato. This is not an unusual event. She frequently says she is going to do something and then turns around and does something else. This is hard for those of us with a memory to understand, but for her, it is as natural as breathing. On the way home, out of the blue she asked, “Are we moving into the new house tomorrow?” I hesitated a moment. Then I said, “We won’t be moving right away.” I didn’t pursue the topic. I don’t know what motivated it. She must have been thinking again that we had talked about moving into a new house. In the rental car center at the airport in Dallas, Kate asked me, “Where are we?” I said, “The Dallas airport in Texas.” She said sadly, I don’t wanna leave Texas.” I said, “But, we’ve had a good time” and gave her a hug. And she doesn’t realize she may not be back. Before leaving Knoxville yesterday, Kate and I made our usual stop at Panera where we both got muffins. Then we made a trip to the cemetery where we visited the Franklin family plot. We stopped at the graves of each person and sensed the memories of our experiences with them. There were a few who died before I became a part of the family, but I had a great sense of the story of this particular family and how close they had been. We stopped a little longer at the graves of Kate’s mother and father and an infant daughter. It was an emotional moment for both of us. I believe it was especially so for me because I believe this will be Kate’s last visit to this place before she passes. The tears welled up in my eyes as we stood in that place. From there we moved on to Dallas where we will catch our plane to Nashville this morning. We drove directly to the home of a childhood friend of mine with whom I have been in contact since the third grade when we met, Carter Owens. One of my earliest memories of him occurred during the 1948 presidential race between Truman and Dewey. He was a big Truman supporter. I am sure most of the other fourth graders hardly new who Truman was. This interest in politics has lasted the rest of his life. He is now a retired political science professor. We met Carter at his home where he lives with his partner and now husband, Michael. They married shortly after we were with them two years ago. We had lunch at a nice French restaurant that was rather quiet for our extended conversation. We had a lot to catch up on. After lunch, we continued the conversation at their home. Kate and I both enjoy their company and had a pleasant afternoon. Around 4:00 we left for our hotel near the airport. We had a fitting close to a very good week. It was everything I wanted it to be. Kate had seen all of the family living in Fort Worth as well as the people who have been most special to her for many years. I wish she were able to savor the memories. Since that is not possible, I am at least glad she was able to enjoy the time she had with each one. Yesterday afternoon Kate and I went to a skilled nursing facility for a visit with the mother of a friend who lives near us in Tennessee. The friend’s mother invited us to have a seat. Kate took hers on a love seat with a table beside it. The friends mother had glass of water on the table. Apparently, she had been drinking it before we arrived. As we were talking, Kate up the glass and took a drink out of it. Our friends mother picked it up and took it to the kitchen and brought Kate a fresh glass of water. I chuckled to myself because I have had this experience quite a number of times. Tonight we are staying in a hotel near the airport in Nashville where we will catch our plane home in the morning. We drove to a pizza place near the hotel. When I opened the door to the car for Kate, I noticed that she had taken her glass from the restaurant. I called attention to it and returned it. This is not the first time this has happened. It is not a typical thing but there have been as many as five times she has done this at restaurants. What does it mean to “know” someone? This is a question I would like to explore in another post. It’s too late to start answering a question like this tonight. Let me simply mention something that happened today that prompted my query. As Kate and I walked to our car after saying goodbye to our son, Kevin, his wife Rachel, and their son (our grandson), Brian, Kate asked, “Who is that boy?” I said, “That’s Brian.” She said, “Who are his parents?” I said, “Kevin and Rachel.” What makes this intriguing is that she had just spent almost two hours with a group of about a dozen family members including Brian and his parents (our son and his wife). We had also had lunch with them yesterday. In anticipation of our seeing them, I had mentioned Brian several times during the trip preceding yesterday’s lunch. Each time she was puzzled and asked, “Who are his parents?” Each time I explained. I am fairly confident that when she was with Brian and his parents that she had a sense of who he is. It seems equally clear that when she asks the question, she does not know who he is. 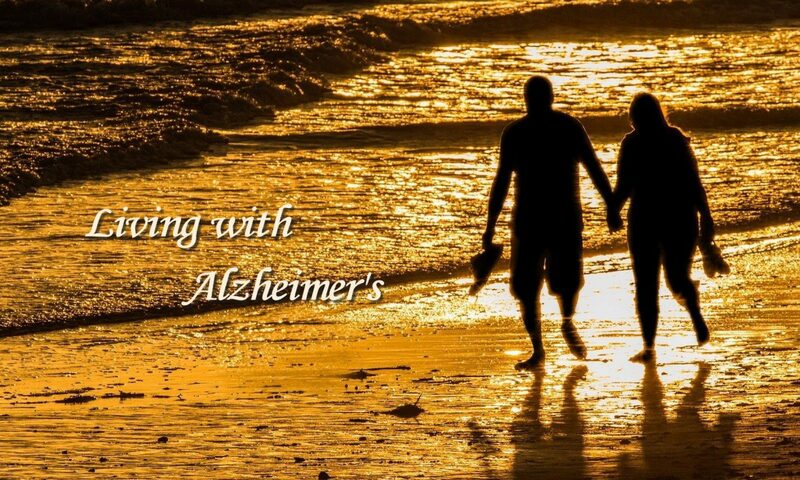 We normally think about an Alzheimer’s patient as either knowing or knowing others. This experience suggests to me that knowing is more than that. It’s a continuum. I think this deserves further exploration.